I was enthused by the opportunity to sample both dates and olives whilst in Morocco - which are both staples of my diet back home. 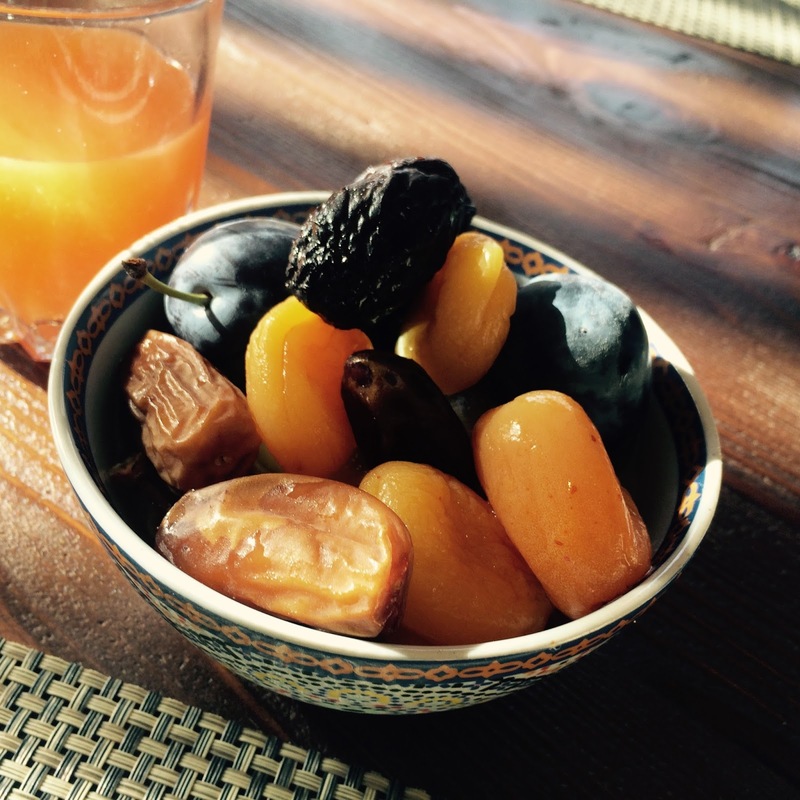 My favourite Moroccan breakfast - a selection of dates, apricots, prunes and plums with a glass of tropical juice. This tasted so good, and I *definitely* need some mosaic breakfast bowls now. The olive trees where so glorious within our hotel grounds, I absolutely adored how close we were to one of my favourite trees... bliss! It was in Spain a few years ago and the introductory of Tapas, I suddenly found myself tasting the most glorious juicy green and black olives and guess what? Enjoying them. As per usual, when I fall in love with something – I fall head over heels. I soon realised that in Morocco, olives come with everything. 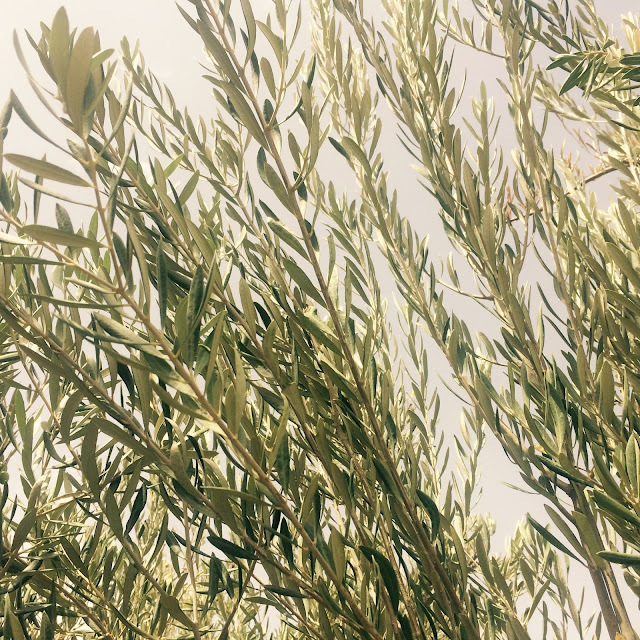 There is no right or wrong time to eat olives – so that’s breakfast, lunch and dinner then! There were ginormous jars at every corner and ample opportunity to sample them. Try as I might, every plate of mine (except breakfast and pudding) included olives. Sometimes a handful, sometimes a mountain. Dates always seem to get a bad reaction in my experiences, but I think they are beautiful - inside and out! Just like any fruit, the irregularity and imperfection is what makes them so naturally good. 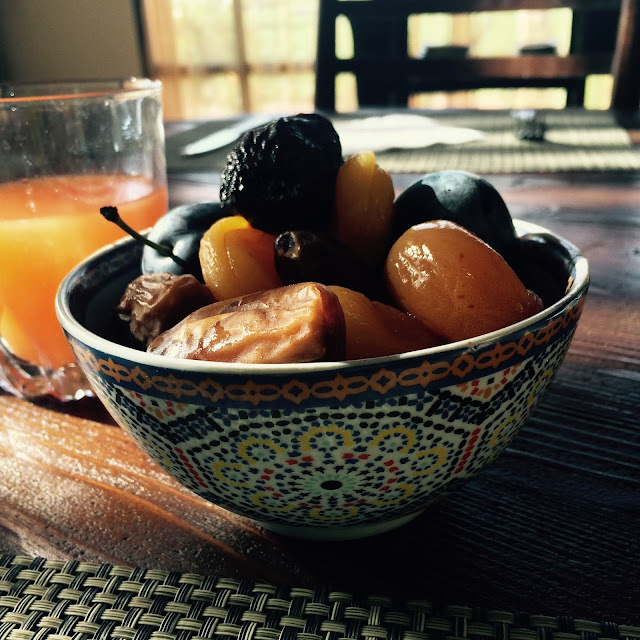 Dates in Morocco where big, and plentiful. They felt luxurious; usually I eat them straight out of the cardboard box and don’t really dress them up on my plate. Eating them at breakfast really gave me a true sense of satisfaction. You know you’ve got food love, when you arrive home and all you want to eat is EXACTLY what you did whilst in another country. This is partially true, but true to my form I was eating my weight in dates and olives before I went to Morocco, but now I feel a rich sense of pride. I want to eat them not only for incredible taste, flavour and nourishment, but for pure joy. This looks amazing, I LOVE olives!